AT&T engineered an unusual low-power antenna system inside a radio quiet zone at a snow resort in rural West Virginia, giving thousands of daily smartphone users network access for the first time. Work on the multimillion-dollar solution started in 2013 and took months of testing with engineers at the National Radio Astronomy Observatory (NRAO) and staff at Snowshoe Mountain Ski Resort. The custom-designed Distributed Antenna System (DAS) network went operational in 2015 and worked well for skiers over the past winter, according to Steven Little, senior radio access network engineer at AT&T. Little compared AT&T’s deployment of 200 different indoor and outdoor antennas working at very low power to the technology equivalent of whispering in a library to avoid disturbing others. “Nobody has anything like it other than AT&T,” he said in an interview on Wednesday. The low-power approach was vital to minimize possible harmful electromagnetic interference with the Green Bank Radio Telescope, a steerable telescope spanning 2.3 acres, that is part of the radio observatory. Snowshoe Resort and the NRAO all sit within a 13,000-square-mile National Radio Quiet Zone that includes Pocahontas County and the Monongahela National Forest on the West Virginia border with Virginia, about a three-hour drive from Washington. 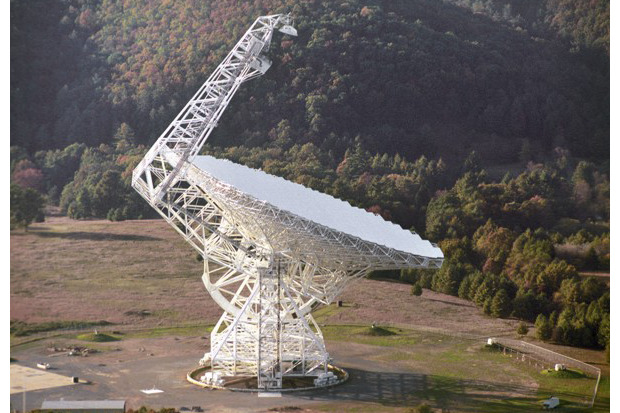 The radio quiet zone was established in 1958 to minimize the interference to the Green Bank telescope, according to Karen O’Neil, Green Bank site director, in a blog. The Green Bank telescope is so sensitive that it is used to find evidence of the Big Bang in the universe. It can detect “one billionth of a billionth of one millionth of a watt of energy, which is less energy that a snowflake hitting the ground,” Little said. Knowing that, Little and other engineers had their work cut out for them. He has worked for 25 years in the radio access field and has designed antenna systems for stadiums, hospitals and other large venues to prevent radio interference by thousands of cellular users all trying to connect to a network at once. The team knew that the radio quiet zone means that normal cellular towers and cell phones are not allowed to transmit signals, much less ordinary wireless garage door openers. Even an electrified but corroded cattle fence had been found to cause a type of interference called Passive Inter-Modulation (PIM) distortion, Little said. AT&T ended up writing software that automatically switches a Snowshoe user’s phone to low-power mode. The Snowshoe users’ phones are reduced to 500 times below their normal power, at 1/1000th of a watt or less. A cell phone normally emits 500 milliwatts when in use, Little said. The DAS antennas are directional and can control the energy emitted to focus in a specific direction, to keep it from spilling out to other areas. The DAS antennas at Snowshoe have a range of about 40 feet, which is well below the 100 feet or more used in typical DAS deployments. By comparison, a typical cell tower can have a range of up to 15 miles. At Snowshoe, AT&T also increased the density of the antennas to accommodate the shorter range. At a large outdoor venue serving 85,000 Boy Scouts elsewhere in West Virginia, AT&T installed about 30 DAS antennas, compared to the 200 at Snowshoe. About three miles of fiber-optic cable connect the DAS antennas, according to O’Neil. With the DAS network operational, inspectors from the observatory and AT&T check power levels regularly, and sometimes daily, to detect any interference, she said. Little said the work at Snowshoe will inform future projects that address growing demands on cellular networks. “Network densification is where everything is going … to increase the capacity of the network,” he said.